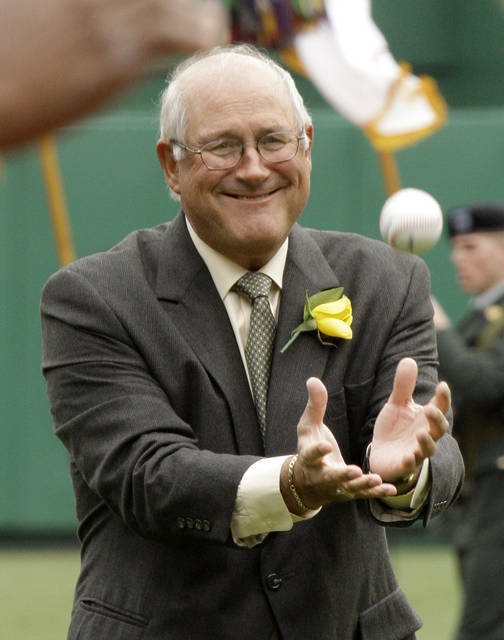 Steve Blass spent his boyhood afternoons in Connecticut flinging a rubber ball against the side of a half-barn, fantasizing that he was pitching in the majors. Come evening, the 10-year-old would get his radio and tune into a game, delighted when Mel Allen’s voice crackled from the transistor. More than in any other sport, baseball broadcasters become an inseparable part of the game they describe. Their voices are the backdrop to all those warm summer nights. Their distinctive calls are part of the game’s lore. Fans visualize the action through their stories and descriptions. 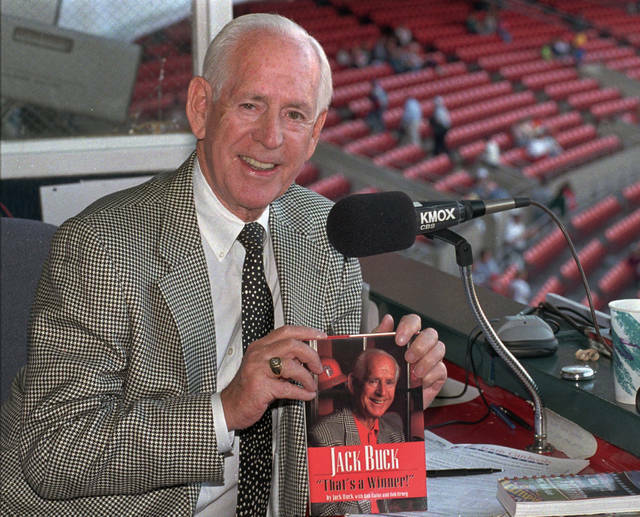 “There’s definitely an intimate link between the fan and the broadcaster that is much more impactful and prevalent in baseball than in any other major sports,” Cincinnati Reds play-by-play man Marty Brennaman said. Both 76, Blass and Brennaman are retiring after the 2019 season, ending long careers in the booth — 34 years for Blass, 46 for Brennaman. Throughout the decades, the wins and losses, and the historical moments they’ve witnessed and described, they’ve also experienced how much fans identify with their voices coming into their homes. They’re treated like adopted family members, greeted on a first-name basis. Brennaman teamed with former Cincinnati pitcher Joe Nuxhall for 31 years in the booth. Fans tuned into “Marty and Joe,” a pair of old friends who visited Reds fans nearly every day from March to October. “The longer you’re around, the more you become part of someone’s daily life, even approaching being a member of their extended family,” Brennaman said. “The time I realized what an impact Joe and I made was when we started getting mail addressed to ‘Marty and Joe, Cincinnati, Ohio’ — no address, no anything. And it went to the main post office downtown and they had no problem at all figuring out where it was supposed to go. The game lends itself to those relationships and over the generations has become intertwined with those voices crackling from transistor radios tucked beneath pillows for night games — Jack Buck on KMOX in St. Louis, Ernie Harwell with WJR in Detroit, Bob Prince on KDKA in Pittsburgh, Chuck Thompson in Baltimore, Harry Kalas and Richie Ashburn in Philly and the great Harry Caray. Unlike basketball or football or other major sports where the action is nonstop, baseball provides many opportunities for broadcasters to fill with stories and personal anecdotes. They weave in updates about their gardens and their travel experiences and their everyday adventures. They do more than describe a jump shot or a touchdown catch or a goalie’s save. They share a bit of themselves. That down time also allows color commentators like Blass to bring the sport to life with stories that revive listeners’ memories. The game wouldn’t be the same without their stories and signature lines. Their distinctive expressions become part of the game’s fabric and history, whether it’s Russ Hodges’ “The Giants win the pennant!” or Brennaman’s “This one belongs to the Reds” after a win or even Nuxhall’s “This is the old left-hander rounding third and heading for home” sign-off. Without the voices, it’s not baseball. Some of the most familiar voices have left in recent years. 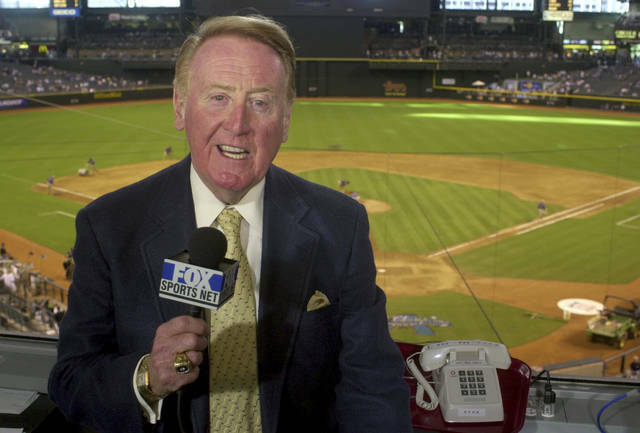 The Dodgers’ Vin Scully — recognized within the business as one of the best ever — retired after the 2016 season, his 67th. The business is changing as well. More and more fans follow games on their computers, mobile devices and television, rather than radio. The novelty of picking up a game on a far-away station, albeit with a little static, is long gone, replaced by easy access to all broadcasts. It’s unlikely that many up-and-coming announcers will want to stay with one team so long or do games on a daily basis. The tidal wave of analytics has changed the game and seeped into how it’s presented. Those calling the action have to be more concerned about reprisals for what they might say on air. Fans in Cincinnati and Pittsburgh will get to enjoy those familiar voices for one last season. It’ll be bittersweet not only for them but other fans as well when they round third and head for home, as Nuxhall would say. “I have people tell me, ‘You get me through the summer evenings,’” Blass said. “It’s so flattering. You don’t think about it that way all the time. It’s much more so than when I was pitching. Now I’m in their lives more. What happened to Raiders’ and Jets’ rebuilding plans? For all those fans of the Raiders and Jets who believed in that rebuilding-program message, their teams have handed them a big “never mind” this week. For fans of the Giants and Steelers, well, maybe that rebuilding tag should be placed on them. During the frenzied two days of “legal tampering” before the NFL’s 2019 business year begins — and even beforehand in Oakland’s case — the future became now for Jon Gruden and Adam Gase. All that talk about setting a solid foundation through the draft and youngsters? A lot of it was just talk. Gruden’s first season in his return as Oakland’s coach was lowlighted by dealing away perhaps his two best players, Khalil Mack and Amari Cooper. The word was that having three first-round draft choices this April would provide a strong base for the franchise when it arrives in Las Vegas next year. The magic word now for the Raiders is spend. They are bringing in pro football’s best receiver of the last decade, Antonio Brown, and giving him more than $50 million over the next three years, with $30 million guaranteed. They agreed to a $66 million contract ($36.75 million guaranteed) with left tackle Trent Brown, whose blocking not only filled a void in New England but helped the Patriots to another championship. And the Raiders will be paying $42 million over four years for safety Lamarcus Joyner . These are not negative moves. If Trent Brown plays the way he did protecting Tom Brady, Derek Carr will do a lot more smiling. Having Antonio Brown as a target — until the wideout begins complaining he isn’t getting enough action — also will bring a wide grin to Carr’s face. And Joyner is better than nearly all of Oakland’s defenders. But when did the frugality that cost them Mack, arguably the NFL’s best defensive player, and the long-range plan that led to Cooper’s departure turn into opening the vault so wide? At least the Jets were more transparent in their approach . They believe they found their franchise quarterback last spring when they drafted Sam Darnold, and they had been pointing to the 2019 offseason — and more than $82 million of cap space — to fill in holes. Still, their spending spree also indicates they’ve become impatient in pursuit of a turnaround in a division where, frankly, combining the rosters of the Jets, Bills and Dolphins might not provide a team capable of knocking the Patriots from their throne. New York’s additions should help lift the Jets from the depths of the AFC, though. C.J. Mosley is a quality linebacker who was overshadowed by Terrell Suggs and Eric Weddle in Baltimore. He gets a monstrous deal of $85 million over five years, with $51 guaranteed. Such money means the Jets expect to get an All-Pro caliber player. The Jets also dived into the receivers pool, but not like the Raiders and Browns did. Adding Jamison Crowder and Josh Bellamy bolsters a mediocre pass-catching corps, but not significantly. Where the Jets are making a huge step toward respectability is bringing in Le’Veon Bell, the best player in this crop and exactly the kind of weapon Darnold needs to help his development. Yes, there are concerns Bell could be rusty, and he’s one wrong off-field move away from a lengthy league suspension. He’s also the right fit for a club whose best recent successes came with high-quality running backs such as Hall of Famers Curtis Martin and LaDainian Tomlinson and the dependable Thomas Jones. With Bell in the Meadowlands and Brown in the Bay Area, the Steelers have taken some huge hits. Their streakiness won’t disappear as they retool, and there are question marks throughout their roster. As for the Giants, the furor over the departures of two of their three best players, Beckham and Landon Collins — he went to division-rival Washington — already is intense. It will grow until the draft, when perhaps the team’s fans will calm down should New York land its replacement for 38-year-old quarterback Eli Manning. This question lingers, though: Why re-sign Beckham last year, making him the highest-paid wideout in NFL history, then make this deal? Perhaps the Giants saw how Brown maneuvered his way out of Pittsburgh for less than equal value and feared a disgruntled Beckham would try the same. Regardless, it certainly seems off-kilter that the folks who wear green to MetLife Stadium are being praised, and those who wear blue are being excoriated. Much earlier in the day, Ravens coach John Harbaugh, Rosburg and his successor, Chris Horton, took their places behind a table on a stage at the team’s training facility. Hired by Harbaugh in 2008, Rosburg ruled over a unit that was perennially among the league’s best. “I can tell you, without Jerry Rosburg here there’s no way we would have had anywhere close to the success we’ve had,” Harbaugh said. Rosburg concluded his brief speech by saying, “Thank you and farewell.” And then abruptly walked off the stage. Ingram and Thomas agreed to terms with the Ravens on Wednesday. The addition of the former Pro Bowl stars eased some of the sting of losing free agents C.J. Mosley, Terrell Suggs, Za’Darius Smith and John Brown earlier in the week. “His mom has a track team, so I might throw a little break that way,” Thomas said. Ingram and Thomas fill key spots, but the Ravens hope they’ll also be able to provide leadership in the locker room. That job was handled primarily by Weddle, Suggs and quarterback Joe Flacco, who was traded to Denver this week. ALAMEDA, Calif. (AP) — After making several big-ticket additions to start free agency, the Oakland Raiders are now making some cuts. The Raiders released 2018 leading wide receiver Jordy Nelson and backup quarterback AJ McCarron on Thursday to create salary cap space after going on a spending spree earlier this week. The moves save more than $8.5 million for the upcoming season after the Raiders committed more than $50 million in salary cap space to acquire receiver Antonio Brown, tackle Trent Brown, safety Lamarcus Joyner and receiver Tyrell Williams. Nelson signed a $14.2 million, two-year deal last March with the Raiders and had 63 catches for 739 yards in his one season in Oakland. The Raiders turned his $3.6 million roster bonus for 2019 into a signing bonus late last season, which leaves them with $1.8 million in dead money this year. Coach Jon Gruden had planned to keep Nelson before plans changed when Brown became available from Pittsburgh last weekend. The Raiders traded a 2019 fifth-round pick to Buffalo last year to acquire McCarron as the backup to Derek Carr. McCarron appeared in just two games with three passes before the team decided to go in another direction. The move leaves Nathan Peterman as the only backup on the roster. Peterman was fifth-round pick by Buffalo in 2017 but was cut last season after beginning the year as the starter. He is 68 for 130 in his career for 548 yards, three TDs, 12 interceptions and a 32.5 passer rating in his career. The Raiders also signed defensive tackle Johnathan Hankins to a two-year contract to return to Oakland and formally announced the deal with Joyner that was agreed to earlier this week. Hankins spent his first four seasons with the Giants and then played for Indianapolis in 2017 before joining the Raiders last season. He had 36 tackles and two fumble recoveries last season for Oakland and will be part of a rotation at defensive tackle with second-year players Maurice Hurst and P.J. Hall, as well as Justin Ellis. Joyner is the most notable addition so far for a defense that ranked last in the NFL in yards allowed per play (6.27) and points allowed per game (29.2) last season. The Raiders coveted Joyner for his versatility; he had experience playing cornerback, in the slot and safety in five seasons with the Rams. He was at his best after moving exclusively to free safety the past two seasons under coordinator Wade Phillips but said he’s ready to play in the slot if needed for Oakland. Joyner looks forward to come in on the ground floor of a rebuild after helping Florida State rebound from a team that struggled in coach Bobby Bowden’s final seasons before he arrived and then won a national championship under Jimbo Fisher in his senior season. COLUMBUS, Ohio – The Division I and II boys basketball All-Ohio teams were announced Wednesday by a statewide media panel. The teams were selected by members of the Ohio Prep Sportswriters Association. On Tuesday, the Division III and IV All-Ohio teams were announced. The Ohio Mr. Basketball Award will be announced Thursday morning. Ben Roderick, Powell Olentangy Liberty, 6-foot-5, sr., 25.9 points per game; VonCameron Davis, Columbus Walnut Ridge, 6-5, jr., 27.5; Devon Grant, Lorain, 6-0, sr., 26.1; Kaleb Martin, Green, 5-9, sr., 19.4; Samari Curtis, Xenia, 6-4, sr., 34.4; Bo Myers, Logan, 6-5, sr., 27.4; Miles McBride Cincinnati Moeller, 6-2, sr., 14.1; Andre Gordon, Sidney, 6-2, sr., 22.6; Alek West, Sylvania Northview, 6-4, sr., 20.2; Andre Harris, Lyndhurst Brush, 6-3, sr., 17.0. Kyle Goessler, Brunswick, 6-2, sr., 22.4; Javohn Garcia, Pickerington Central, 6-3, sr., 20.1; Luke Floriea, Mentor, 5-10, jr., 19.1; Lunden McDay, Akron St, Vincent-St. Mary, 6-3, sr., 16.5; Ra’Heim Moss, Springfield, 6-4, sr., 18.0; Michael Kreill, Vandalia Butler, 6-1, sr., 15.3; Jack Sawyer, Pickerington North, 6-5, soph., 22.2; Josiah Fulcher, Lima Senior, 6-1, jr., 17.1; Eddie Colbert, Toledo Whitmer, 6-6, sr., 20.1; Kade Ruegsegger, Dover, 6-3, jr., 16.2. Samuel Emich, Copley, 6-6, sr., 16.8; Sencire Harris, North Canton Hoover, 6-4, fr., 20.4; Matt Allocco, Hilliard Bradley, 6-4, jr., 16.3; Dominiq Penn, Dublin Coffman, 6-0, jr., 19.9; Sean Marks, Lewis Center Olentangy, 5-10, sr., 19.8, 6-2, sr., 14.1; Alec Pfriem, Cincinnati Moeller, 6-4, sr., 15.0; Jackie Harris, Toledo St. Francis, 6-7, sr., 21.8; Taevon Pierre-Louis, Lorain, 6-6, sr., 18.0; Eric Hanna, Olmsted Falls, 6-0, sr., 18.8; Anthony Mazzeo, Massillon Jackson, 6-3, sr., 17.1. Brady Snyder, Canal Winchester; Max Martz, Upper Arlington; Jeremiah Keene, Westerville North; N’Keeley Elmore, Columbus Northland; Bryson Lane, Olentangy Orange; Jordan McMillian, Westerville South; D.J. Dial, Lyndhurst Brush; John Hugley, Lyndhurst Brush; Keaton Williams, Dresden Tri Valley; Ian Sexton, Dover; Jake Maranville, Uniontown Lake; Derrick Anderson, Youngstown Boardman; Julian Jackson, Massillon Perry; Todd Simons, Austintown Fitch; Jayvon Maughmer, Chillicothe; Bash Wieland, Liberty Township Lakota East; Garrett Denbow, Ashland; Devin Williams, Toledo Start. Tehree Horn, Sylvania Southview; Isaac Elsasser, Bowling Green; Ryan Nunn, Findlay; Max Denman, Whitehouse Anthony Wayne; DaSean Nelson, Toledo Rogers; Sam Clear, Sylvania Northview. D’Arris Dean, Cincinnati Aiken, 6-0, sr., 21.9. Otto Kuhns, Carroll Bloom-Carroll, 6-3, jr., 22.0; Luke Howes, Fairview Park Fairview, 6-2, jr., 22.6; R.J. Clark, Youngstown Ursuline, 5-11, sr., 21.3; Ethan Heller, Thornville Sheridan, 6-1, sr., 21.5; Cam Evans, Chillicothe Zane Trace, 6-0, jr., 25.2; Joey Edmonds, Cincinnati Wyoming, 6-0, sr., 19.0; Milton Gage, Dayton Chaminade-Julienne, 5-11, sr., 17.9; Paul McMillan, Cincinnati Hughes, 6-2, fr., 25.1; Cade Stover, Lexington, 6-5, sr., 18.0; Kobe Mitchell, Cadiz Harrison Central, 6-1, soph., 25.5. Spencer Hall, Louisville, 6-8, sr., 13.5; Trey Woodyard, London, 6-6, soph., 16.0; Erik Painter, Bay Village Bay, 6-1, sr., 20.0; Treohn Watkins, Columbus South, 6-0, sr., 13.4; Quentin Richardson, Parma Heights Holy Name, 6-0, jr., 20.8; Mason Montgomery, Vermilion, 6-3, sr., 19.4; Levi Seiler, Wauseon, 6-4, sr., 17.3; Nate Voll, New Philadelphia, 6-2, sr., 14.1; Evan Conley, Lancaster Fairfield Union, 6-0, sr., 18.2; CJ Napier, Middletown Fenwick, 6-5, sr., 19.3. Myles Martinez, Columbus Centennial; Josh Irwin, West Geauga; Josh Raley, New Concord John Glenn; Craig Bober, St. Clairsville; Jordan Zimmerman, Steubenville; Gabriel Roach, East Liverpool; Brice Williams, Minerva; Blane Himmelheber, Alliance Marlington; Chris Richardson, Richfield Revere; D.J. Snyder, Peninsula Woodridge; Luke Fennell, Canal Fulton Northwest; A.J. McClellan, Cortland Lakeview; Braeden O’Shaughnessy, Poland Seminary; Cooper Donaldson, Jackson; Elijah Williams, Athens; Seth Dennis, Vincent Warren; Devin Carter, Greenfield McClain; Gavin Arbaugh, McArthur Vinton County; Nekhi Smith, Cincinnati Taft; George Mangas, Lima Shawnee; Quan Hilory, Mansfield Senior. Tahj Staveskie, Sandusky; Brennan South, Bellville Clear Fork; Isaiah Alsip, Galion; Adam Scott, Wapakoneta; Jaron Sharp, Kenton; Genesis Warith, Toledo Scott.